I love the color orange, in spite of myself. It’s a loud color. A sarcastic color. Orange is the color that recites dirty limericks in front of your grandmother. But it is also the color of the meatiest part of the afternoon, when the sun is flexing its last bits of daytime muscle before retreating into the softer folds of pink and mauve. It is the color of the shag carpet from preschool – the tufted, polyester lawn that cradles small, dream-filled heads every afternoon. And it is the color that never fails to make me happy, even amidst a swirling sea of very gray days. But what does the color orange taste like? It’s cheating to say it tastes like that citrus with the same name. Too easy. And too simple. I think the color isn’t quite so sweet. It’s more jumpy. More hyper. With an arched eyebrow and that throaty laugh that comes from eating too many sweet tarts. It’s just…more. I set out to make an orange soup the other day. In order to fit more easily into searchable categories and whatnot, I will hang my head and call it “carrot soup” here, though that’s a bit like describing Gene Kelly as an “actor.” It started with carrots, then onions, then wine. A note in the Flavor Bible reminded me that carrots lose some of their carroty brightness when they are cooked, so the carrots that make up the base are boosted by a generous handful of raw, grated carrots at the end. Garlic for integrity. Cumin for complexity. Lemon for acerbic wit. And a little mint for fun. This is fine to eat right away and hot, but if you can hold out until at least a few hours later (if not the next day), when it has had time to properly chill and the flavors can really get to know each other, it’s so much better. It really shines when eaten cold, like an orange gazpacho. Use it to brighten your day when all else fails. I have it on good authority that it works wonders. 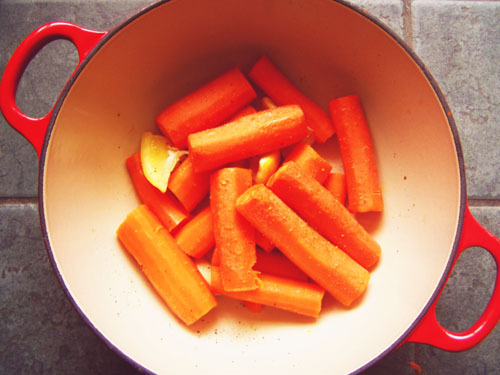 Cut five of the carrots into small disks, no thicker than ¼”. Bring the water, wine, and broth to a gentle boil in a medium saucepan or dutch oven (whatever you cook it in, be sure you have a lid). Add the diced onion, sliced carrots, crushed garlic, and bay leaves and turn the heat down until simmering. Cover, and simmer for 15 minutes. Remove the pot from the heat and carefully remove the bay leaves. Working in batches, blend until smooth in a blender. As I’ve mentioned before, be sure to keep a hand on the blender lid to avoid a painful geyser of hot carrot mess. After each round of blending, transfer the newly smooth contents to a large bowl or Tupperware (something that will hold the whole batch with a little room to spare). 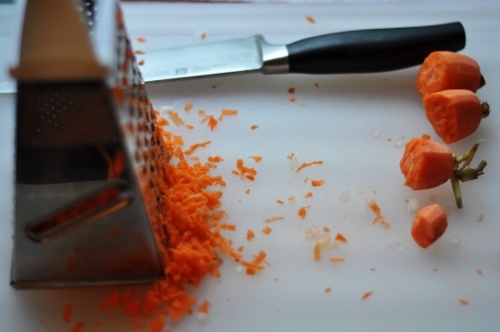 After you’ve blended it all, set it aside and grate the remaining carrot. Chop the mint as finely as possible. 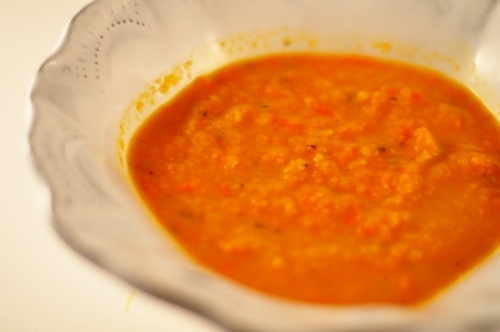 Fold the grated carrot and chopped mint into the soup, stirring well until fully combined. Add the lemon juice, cumin, and salt. Once you’ve really stirred it up, taste it to see if it needs more salt. Adjust as needed, chill, and enjoy. 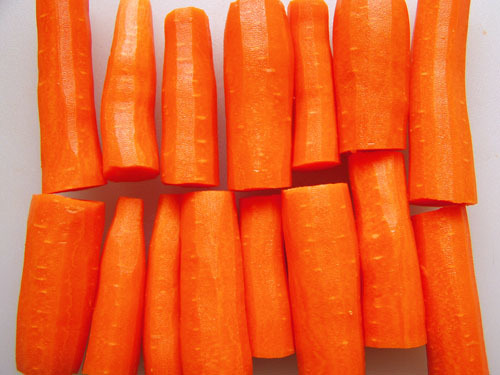 When was the last time you gave more than a fleeting thought to carrots? They seem so rooted in the province of lunchbag snackery that I sometimes forget the many ways they can be gussied up for dinner. That’s the danger of being a perfectly delicious raw vegetable. Who wants to bother dressing you in a cocktail dress with you when you can carry the show in your street clothes? I also don’t care keenly for making carrots sweeter, though that seems to be a common tendency. Glazed carrots can be very lovely, but I want to eat them about as often as I want to watch Sleepless in Seattle (and for the same reason: too cloying for regular consumption). Carrots are, in fact, the Meg Ryan of the vegetable world – spunky, pretty, predictably sweet, and generally inoffensive – and while I might not want to partake on a daily basis, it’s silly to shut them out completely over a single role I find difficult to swallow. Here are two variations on the same theme – carrots flavored gently with citrus and herbs by boiling them until slightly squishy. Do not be alarmed if the second variation smells like old socks while it is cooking. I promise, it only tastes of carrots. Once the carrots are done cooking, you can play around with how you serve them. I enjoyed the first batch both hot (chopped coarsely and splashed with balsamic vinegar) and cold (no frills, just a little additional salt). 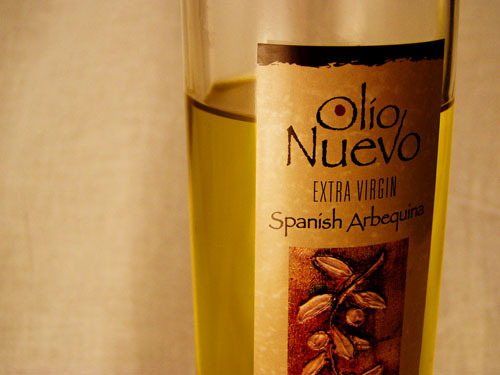 For variation 2, I used the early harvest Spanish Arbequina, an artisan-crafted extra virgin olive oil from Olio Nuevo. Made in Paso Robles, it has a piercingly bright taste that almost seems to vibrate on the tongue. When tucked among the billowy folds of the smoothly blended carrots, it sings out with effervescent harmony. The Salty Spoon is powered by	WordPress 2.7 and delivered to you in 0.223 seconds using 23 queries.